Red Bull Racing’s Daniil Kvyat has pipped the Mercedes of Nico Rosberg for Friday practice honours at the Japanese Grand Prix. Rain lashed the circuit for most of the day, subsiding only for the first hour of second practice in the afternoon, preventing teams from gathering useful data for qualifying and the race on Saturday and Sunday. Only 12 cars were able to set tentative laps during free practice one, but all drivers bar Valtteri Bottas were able to set a time on Pirelli’s intermediate tyres during the day’s later session. Kvyat’s quickest time was just 0.023 seconds faster than Rosberg’s, who was half a second faster than teammate Lewis Hamilton, with Kvyat’s Red Bull teammate Daniel Ricciardo close behind. The Ferraris of Sebastian Vettel and Kimi Räikkönen languished a second further back from the competing Austrian and German teams. That Red Bull Racing’s downforce-laded RB11 chassis was able to sit atop the timesheets in a wet session was unsurprising given grip is preferable to power on the slippery Suzuka surface. 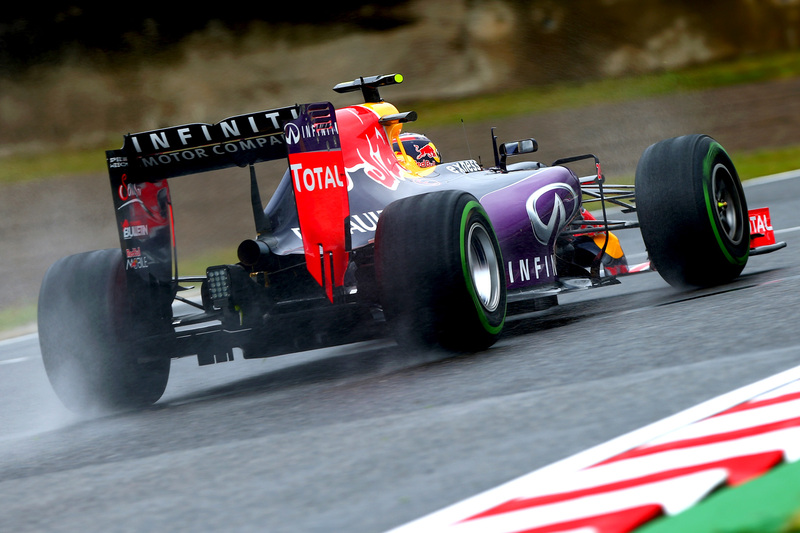 “In the corners in the wet the chassis has always been quite good,” said Kvyat after the session. “[But] there was not so much to be concluded today, it’s only Friday. Few teams were running any comprehensive programmes given the weather forecast for the next two days is for clearing weather, with a small chance of rain during qualifying and a slimmer chance still on race day. “We don’t know what the weather is going to do tomorrow, but it is going to be quite interesting to see,” said the Russian. “We are ready anyway, and we will see. Williams and Valtteri Bottas, however, were alive to the possibility of needing fresh wet-weather tyres for the weekend and decided to sit out second free practice completely to save their intermediate tyres. Fernando Alonso was forced to sit out most of the second session while his McLaren engineers changes is problematic Honda power unit. His engine, competing at the Honda-owned Suzuka Circuit at Honda’s home race, developed a problem during morning practice, meaning he has missed the lightest rain and was unable to set a representative lap time for the conditions on any of his 10 laps — though Jenson Button in the sister McLaren was only twelfth fastest by session’s end.